Middleweight kingpin Sergio “Maravilla” Martinez (47-2-2, 26 KOs) steps in the ring Saturday night to defend his lineal middleweight title against unbeaten British middleweight “Dazzling” Darren Barker (23-0, 14 KOs). Boardwalk Hall in Atlantic City, New Jersey will play host to the event and HBO World Championship Boxing will broadcast the action live beginning at 9 PM ET / 6 PM PT. Sergio Martinez is coming off a dominant TKO over WBO jr. middleweight titlist Serhiy Dzinziruk in March, only two months after his WBC middleweight title was stripped to give Julio Cesar Chavez Jr. a chance to compete for it. 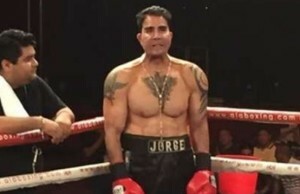 After a monumental 2010, which included victories over Kelly Pavlik (UD12) and Paul Williams (KO2), Martinez has been unable to attract a high-profile opponent. Considered a high risk – low reward opponent, Miguel Cotto, Floyd Mayweather, or Manny Pacquiao have shown little interest in meeting Martinez, even at a catchweight. Martinez and his advisor, Sampson Lewkowicz, have stated they will petition the WBC to mandate a fight with Chavez should he get past Barker without any setbacks. 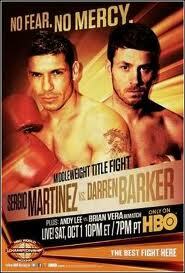 Barker is a huge underdog coming in, standing currently at a 25-1 long shot. He has fought all but one of his fights in the UK – the one time traveling abroad being a 2008 non-title victory over Larry Sharpe. Barker is a two-time British middleweight, and current European middleweight champion.